Academic Staff Union of Universities Benue State University Chapter (ASUU-BSU) Important Notice to all Students on the Vacation of Hostel Due to Indefinite Strike. 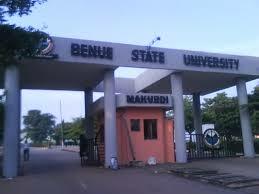 The Management of Benue State University, Makurdi received a communication from Academic Staff Union of Universities (ASUU-BSU) on the indefinite, total and comprehensive strike action by ASUU effective Sunday, 4th November, 2018. 2) Management observed that the ASUU strike would affect Second Semester 2017/2018 Academic Calendar in the University. 3) Consequent on the above, Management wish to advise and direct that all students vacate the University hostels and hope for a swift resolution of the strike. 4) Management highly regrets any inconvenience arising from this strike action.